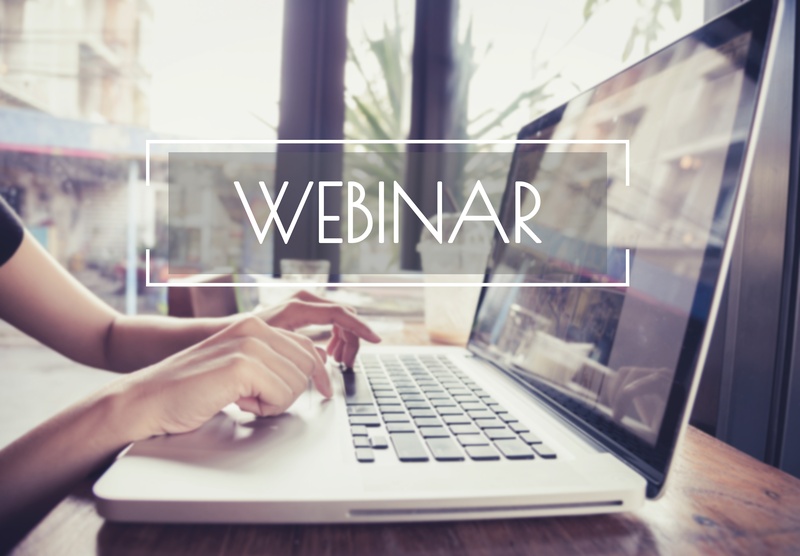 Earlier this week, Circulation hosted a webinar on how to plan, enhance and budget for a transportation benefit in 2019. Here's a summary of what you may have missed and for those who just want to jump right into it, scroll down to see the full webinar recording. Recently, a client told me that their transportation program “is so much more than just a line item on a budget.” That’s what inspired us to host this webinar and narrow in on why hospitals, independent clinics and even health plans need to think about transportation as an investment, rather than just dollars and cents going out. We also talked about strategy and offered some tips on how to look at the myriad benefits from solidly run transportation programs — touching patient care and impacting financial bottom lines, as well. The webinar also offered up some tips on how to turn these insights into action with best practices that will not only help clients better track those benefits, but will help them “level up” their knowledge of the platform. As part of the webinar, Circulation COO Caitlin Donovan overviewed some of the latest research studies on how NEMT positively affects patient care and even provided some case study examples of how existing clients have experienced the benefits through their own NEMT programs. Earlier this year, our blog post “Size up the transportation barrier with these 6 stats” highlighted several research studies that prove the benefit of providing non-emergency patient transportation. 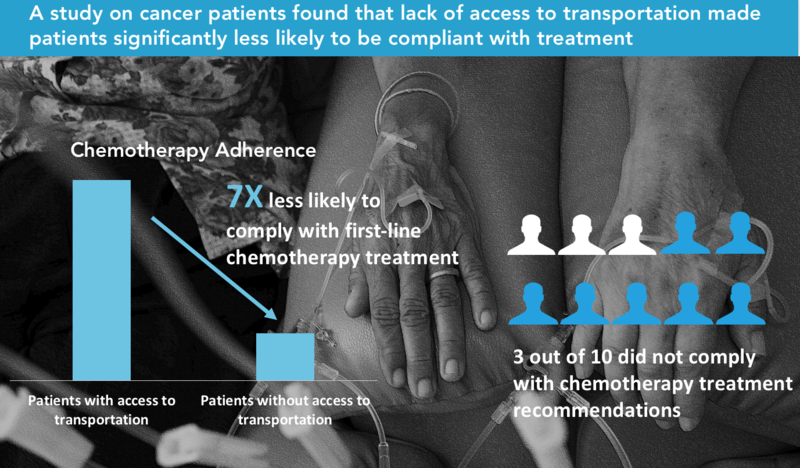 For the webinar, Caitlin added some key stats from research studies that underlined the importance of transportation on patient care — like a study on cancer patients (shown in the slide below) that found that patients without access to transportation were 7X less likely to comply with first-line chemotherapy treatment. Or a study that was done by our partner, Logisticare, which looked at the ROI of transportation for patients undergoing kidney dialysis, diabetic wound care, and substance abuse disorder. They calculated the total ROI (per 30,000 members) to be $40 Million per month. They also surveyed a subset of those patients where 58% reported they would no longer be able to attend any of their medical appointments if their NEMT benefit were to be stripped away. When looking at the performance of transportation programs, we challenged folks to think about various metrics that could be tracked to prove the value of on-demand patient transport. 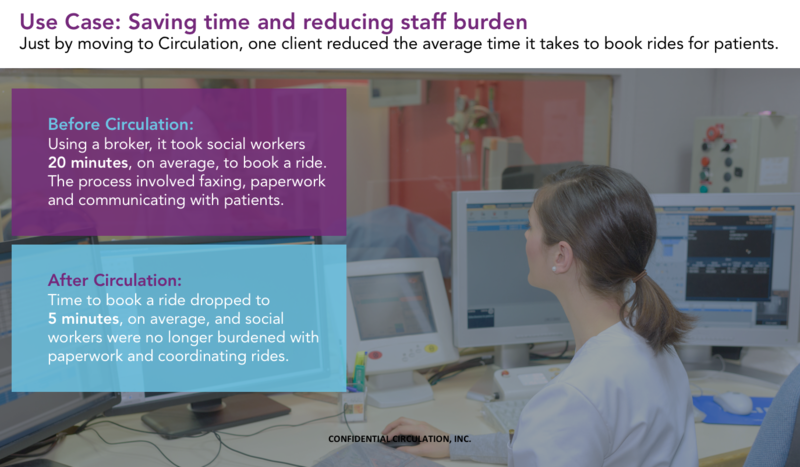 - Like the clinic that looks at how their transportation program helps to reduce 30-day readmissions for their patients who’ve recently been discharged from the hospital. - Or the hospital that uses Circulation to keep patients in-network, paying for them to take rides to in-network providers if the rates are favorable. - Or the children’s hospital whose staff’s time has been freed up just by using Circulation. For what used to be a 20-minute ride booking process, with Circulation, the time to book a ride has been reduced to 5 minutes, at most. Last, Natalie Cicciari, Circulation’s VP of Client Services, talked about some best practices to help with rolling out a new transportation benefit or improving an existing one. - Should rides be booked by a centralized team or by individuals taking care of patients directly? - Should we pilot this first or launch it across the organization? If a pilot, what does success look like? - Do I have a “Champion” in place? Essentially someone who will work cross-functionally to help with adoption and explain the benefits of a transportation program? - How do I educate my patients? Natalie weighs the merits of each and even shows two unique Circulation features that make it easier for clients to track, measure and budget for their transportation programs. With that, here is the webinar below. Enjoy!